Founded in 1994, Mackevision has a team of more than 500 employees and is headquartered in Stuttgart, Germany, with offices in Munich and Hamburg as well as in the United States, United Kingdom, China, South Korea and Japan. Mackevision offers creation, visualization and production services for online product configurators, digital and print catalogues, virtual showrooms, point-of-sale-kiosks, augmented and virtual reality experiences, as well as broadcast video and feature films. Mackevision has developed a differentiated ability to leverage engineering data to construct 'digital twins' of complex physical products. By applying the latest techniques in CGI, visual effects and AR/VR, Mackevision can generate nearly any type of visual content from these twins – effectively turning engineering data into truly immersive product experiences and virtual applications. This highly-specialized approach has the potential to transform product design as well as fuel the next generation of consumer experiences. Mackevision has earned international acclaim for its work on the HBO Series "Game of Thrones" – for which it was awarded an Emmy for Outstanding Visual Effects. The company’s high-end creative and visual effects capability is especially relevant in the growing field of extended reality, where life-like models and environments are considered critical to creating fully-immersive experiences. With clients including Audi, BMW, Chrysler, Hyundai, Jaguar, Land Rover, Mercedes-Benz and Porsche, Mackevision has achieved its most notable success in the automotive industry – where CGI-based and 'digital twin' visualization has experienced some of the earliest adoption. 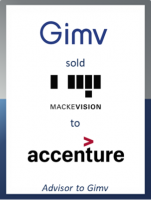 "Mackevision is delighted to become part of the Accenture family," said Mackevision CEO Armin Pohl. "With more than 20 years’ experience in 3D visualization, our visionary technology and our efficient Single-Source Publishing (SSP) approach, we create relevant, inspiring product and brand experiences with lasting impact. We have moved from being a content provider to providing relevant end-to-end solutions for our clients, and we’re looking forward to creating meaningful client experiences on a global scale under Accenture Interactive." CEO Armin Pohl added: "We thank GCA Altium for their support and dedicated project management, which helped us to find the right strategic partner to spur Mackevision’s future success. GCA Altium’s deep sector insights and global presence, as well as the professional deal execution facilitated a win-win situation for us and our new partner Accenture." Sascha Pfeiffer, Managing Director of GCA Altium, commented: "The digital transformation of the global automotive industry has recently been a core focus of our technology M&A practice. We are very proud to announce this transaction with our client Mackevision, the Global Hidden Champion in the virtual reality services space."